To further enhance the post I have included some tunes from Greensky Bluegrass embedded here below, so push play and read away. I was fortunate enough to be invited to one of my favorite places on earth for one of my favorite events by one of my favorite people. 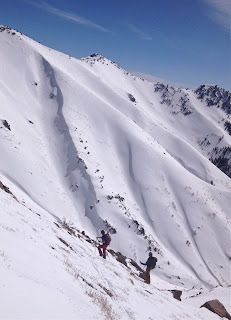 My good friend and long time ski touring partner, Ben Geiger, had some extra tickets for the Telluride Bluegrass Festival, and offered to take me along. We jumped in our friend Brian's ride and boogied south. No matter how busy my crazy life was I could not turn it down. Ben is a stud for taking me, and Brian for driving me. I can't thank Ben enough for the couple days of rest, relaxation, and good times in one of the most beautiful places on the planet. Telluride is near and dear to my heart as I shared an epic weekend at this festival with my Mom, Dad, and wife a few years back. My wife and I loved Telluride so much that we also made it our honeymoon destination for our winter wedding just over a year ago. 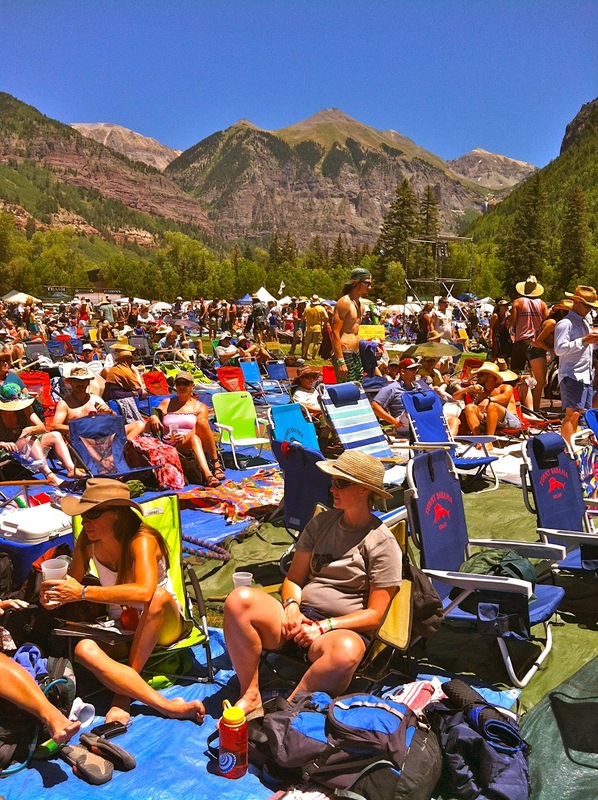 Telluride is a very special place, and I had to do whatever it took to take Ben up on his offer to treat me to the best bluegrass festival around. 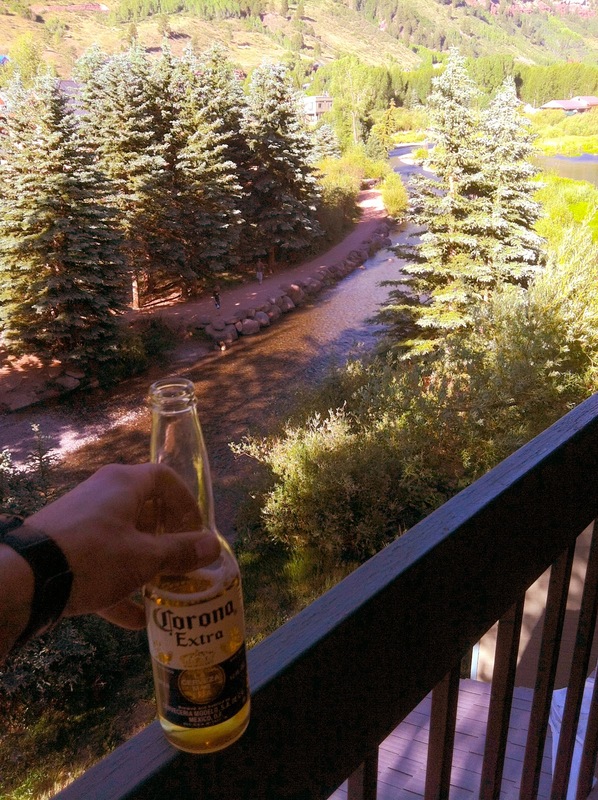 ^This photo of my ice cold Corona on the railing of the condo deck overlooking the gentle waters of the San Miguel River that cut this box canyon gives no justification to the satisfying feelings I was intoxicated with. I have to give a million thanks to Ben and I's good friend, Frank Wilson. Frank is the owner of this gorgeous condo along the riverside that is just steps away from the festival grounds. He has been going to this festival longer then I have been alive, and his hospitality was such that I feel I may never really be able to repay him for it. Frank, his family, and his friends are among some of the most genuine and good hearted people I have met in this life. I am so grateful for the shared experiences we had, and the welcoming nature they showed me. They did not have to be so great to me, but they were more fun and more kind then I could have ever hoped for. ^Views like this. Really? If you can't get down to earth and get down to some bluegrass in this setting, then you might have a problem. All sorts of colorful folks amongst some of greatest scenery on this beautiful planet. Bluegrass runs through the blood given to me by my father and mother who blessed me with an entire childhood lived with the soundtrack of fiddles and banjos. They introduced me to bluegrass at a young age, and we have had the pleasure of sharing it with each other as far back as I can remember. My family may not have been with me for this trip, but I was feeling the love for all of us. ^Come on. That is beautiful. Let's dance! ^As the sun set on my time at the festival I was overcome with the power of this place, this music, and these people. Near the end of my time at the Telluride Bluegrass Festival I slipped out of the grounds for the very last encore of the band that was playing. 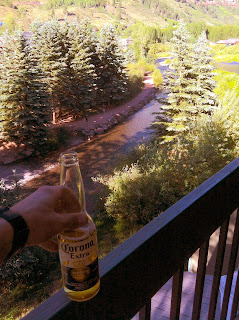 I did so in order to enjoy the tunes while sitting alone on the banks of the magical waters of the San Miguel river. I needed to take a moment to look around while giving thanks to the universe for putting me in this place and time. As the waters trickled by, and the band rocked out their encore, I stared into the vibrant night sky and spoke aloud to all those that have gone before me that have guided my blessed existence. Just as I was finishing up what I had to say to them, a shooting star dashed across the night sky from one high mountain ridge to the other. I immediately stood up and put my arms out to the heavens thanking them for the outward physical sign of their attention to my appreciation of them and the blessed existence they have helped deliver me to. I could not be doing what I am without their influence and guidance. I really am truly blessed to be so lucky in my life, and it is them, my family, and folks like Ben and Frank that have made it all possible for me. Thanks all.